DecalMyWall.com - Vinyl Wall Decals: Some New Features! We are super excited to have some amazing new features on our website that will enhance your browsing experience with us. See the screen shots below! Wish Lists have been improved and now you can categorize them. Yep, different list for different wishes. Also, you are able to share a link so others can view your wish list, if you so choose. Another cool feature is the pop-up window with related suggested products. What this means is, when you add something to your cart, you don't leave your current page. 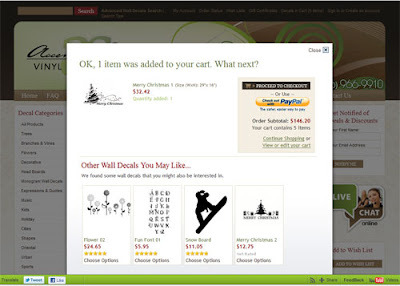 A small window will pop-up and display your selection, show you other products you might also like, and allow you to just go straight to your cart from there if you want. Leave a Product Review... It's easy!